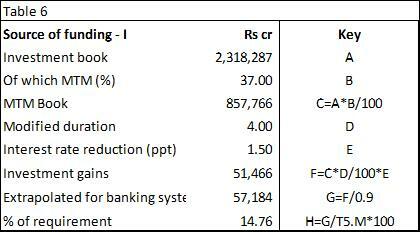 The Bookkeeper’s concerns on the state of the Indian banking system are now well known. In this post it has been attempted to quantify the issue and this analyst is pleased to note that the problem, while steep, a resolution is not a pipe dream. In policy, like in comedy, timing is everything. As such, steps taken to solve this problem will have to be swift to placate investors and industries that the problem is well in hand. The more drawn out the solution, the less potent the impact. For the puposes of this analysis, The Bookkeeper has painstakingly compiled the latest available data for 16 public sector banks (PSU banks) that account for ~90% of PSU Banking NPLs. 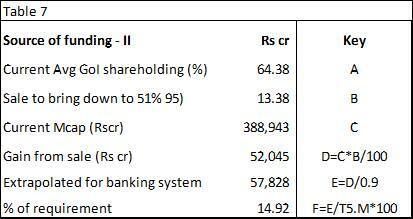 It may be noted that NPLs in the PSU banking space account for ~90% of system NPLs. 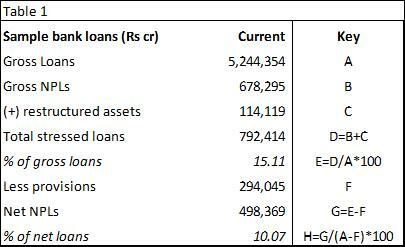 As mentioned in the last post, NPLs are primarily a PSU bank issue and it is there that a solution needs to be provided. The Bookkeeper has assumed that Gross NPLs are fully recognised by now, but to be conservative has factored that all currently stressed assets will become NPLs. To this, a recovery rate of 25% has been applied. Notably, this 25% rate is the current rate at which secured creditors are making recoveries. It is at a sharp discount of the recovery rates of over 70% in OCED countries and it is hoped that India’s own rate catches up especially now that the Insolvency and Bankruptcy Code has been passed. 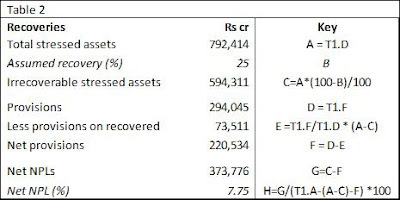 After this, sample PSU Banks will still have to deal with Gross NPAs of nearly Rs 6 lakh crores (1 lakh crore = 1 trillion) and Net NPLs of over Rs3.7 lakh crore. 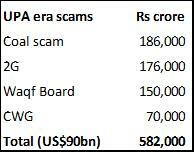 To put this in perspective, the total shareholders funds for the sample is Rs 5.17 lakh crore. In % terms, the Gross NPLs (incl stressed assets) will be 11.78% for the sample banks and net NPLs at 7.75%. The Bookkeeper assumes that the government is comfortable with a Net NPL level of 2.0%, which is in-line with the average banking system net NPL level during the boom years of 2002-2009, when the banking system advances were rising at a 26% Cagr. As such, an additional provision of Rs2.82 lakh crore (US$44 billion) is required to achieve the required NPL coverage. 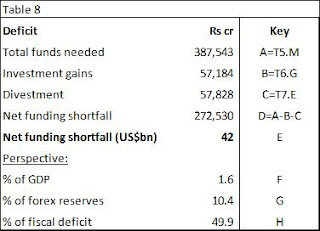 Note, if a net NPL (%) number of 1% is desired, an additional provision of US$51 billion will be needed. 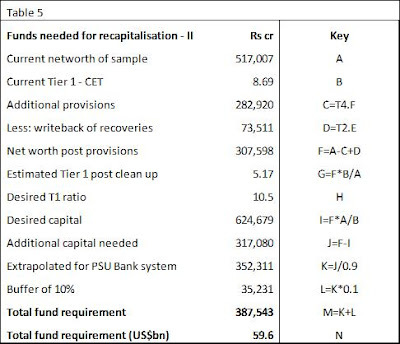 Post this write-off/ provision, the Tier 1 equity capital will come down to the uncomfortably low level of 5.17% thus stymieing any future growth of the PSU banking space. As such, the government will need to recapitalise banks again back to a comfortable Tier 1 equity level. 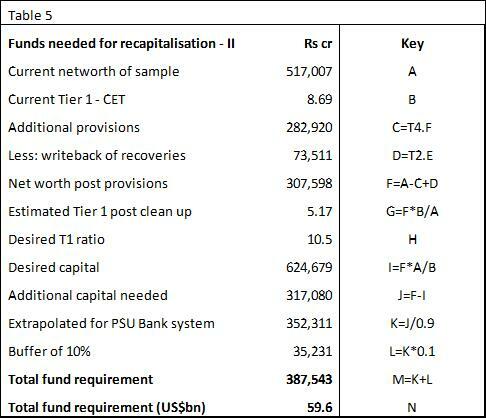 The Bookkeeper assumes that 10.5% is that level and it would take a total of Rs 3.87 lakh crore to recapitalise the entire PSU banking space (including the amount needed for loan provisioning). In US$ terms, about US$60 billion will be needed. Just to put this number into perspective, the entire mess of the PSU banking system (as estimated by The Bookkeeper anyway) is still 50% lower than just a handful of the allegedly many scams that occurred during the previous administration. With increasing pressure on the RBI to reduce rates, The Bookkeeper believes that investment gains on the Mark-to-market (MTM) investment book of banks due will provide some cushion for NPA provisions. However, investment book now is only about 40-45% of gross loans, vs. 65-70% that it used to be during the late 1990s. Also, yields on government bonds are now at 6% levels instead of 12% level of the late ’90s. As such, investment gains of even a 150 bps decrease in rates will amount to only ~15% of the total requirement. 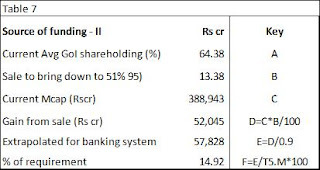 Another source of funding can be the divestment of stakes in PSU banks till the government owns only 51%. This will be a compromise between the need to raise funds and the ability to convince labour unions at the banks to not oppose these reforms. 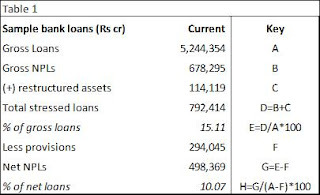 While it is almost certain that PSU bank stock will rally hard once concrete steps are taken to cleanse NPLs, this author has, in the interests of conservatism, assumed that divestment takes place at current prices. 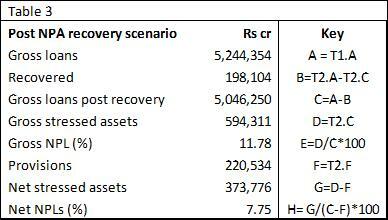 In such an event, another ~15% of the requirement can be raised (Rs57,828 crore, US$8.89 billion). 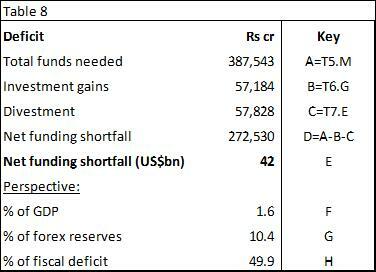 While the demand is steep, the amount of US$42 billion is not something that is unhandle-able for the government should push come to shove. In fact it is almost reminiscent of the’Savings & loan’ crisis of the 80s and 90s in the USA where the cost to the tax payer came out to be between 2-3% of the American GDP. It is The Bookkeeper’s advice that the government act before an impasse arises. If PM Modi moves at his pace he can handle the fall-out and mould public opinion. If it is done out of lack of alternatives, the strong leader looks weak, due to the activities of un-electable politicians. The next step of course is for Narendra Modi to create such a system that never again are public banks molested the way they allegedly were during the UPA years. But that is another story, for another day.